''Birthday!'' squealed my three year old, "Who's birthday is it Granny?'' he asked. ''Mummys's'' she said. ''Mummy's birthday!, yay yay yay! Its Mummy's happpyyy bddddaaay, I will have cake!'' and everyone started laughing... and I thought to myself, ''Wow children are so simple in their ways, all they want is cake on a birthday be it theirs or anyone else's''. But then don't all of like a slice on that special day? I love making cakes, but that's no secret, this blog bears testament to that. I also never miss an opportunity (read birthday be it mine or family's) to whip up a cake with fresh seasonal produce and in case of the baby with fun fondant cake toppers. This year however I've constantly been under the weather and so avoided baking my own birthday cake. This however does not deter me from posting a lovely cake recipe here on the blog (If I can't make one, I can at least post a recipe and be glad). 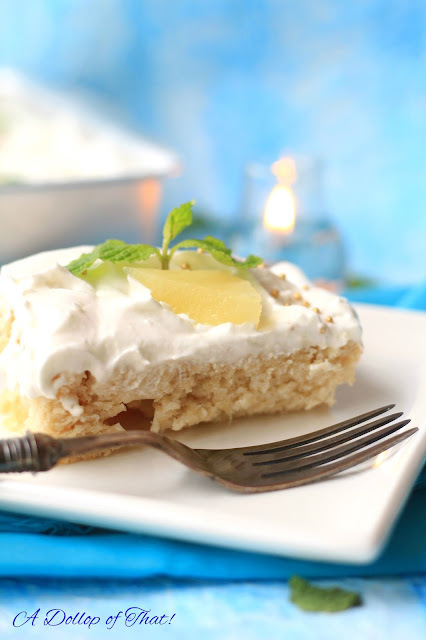 The recipe today is a milk lovers delight, the Tres Leches Cake meaning three milks (in Spanish), is as stated a cake made from three milks, whole milk, condensed milk and evaporated milk. 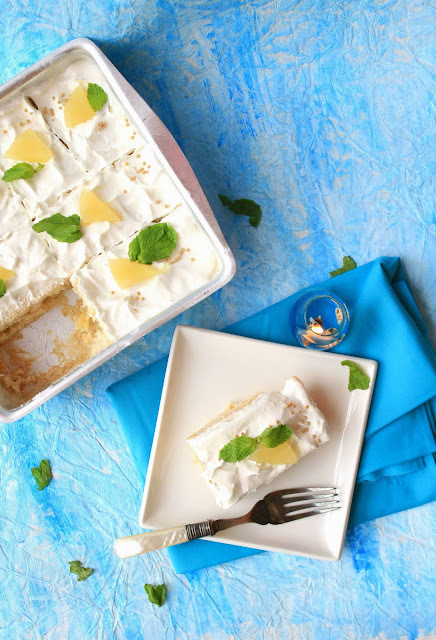 Supremely popular with food bloggers the world over owing to its fool proof simplicity in making along with its divine creamy taste, this cake is a perfect dessert if you want impress guests. The best part is that you can make it a day ahead and allow it to soak up all the three milks as you rest it in the refrigerator. Last month as my better halve's cousins decided to pay us a visit, I started to assemble the required ingredients. Traditionally a piece of Tres Leches cake is decorated with a maraschino cherry, but as I searched heaven, hell and high seas I found none. No maraschino, no fresh cherries, no canned cherries not even candied cherries. All the canned tin aisle presented were cans of pineapple slices, I sadly picked up a tin and thought of incorporating it into the recipe. If you read this space regularly you would know that I love combining pineapples with coconut milk, my Pinacolada Cake and Smoothie recipes bear testament to the same. A bit of googling (this term must be included in the dictionary, its high time... don't you think?) confirmed that what I was thinking has indeed been done before and apparently by Latin American's themselves. (what a great thing to do with your granny's recipes I say!) so I read up a couple of recipes and as always gave my own spin to what people had already done. Just enough milk (approx 1/2 cup) to whip up a thick, spreadable paste. Generously grease a 7x7-inch baking pan. In the bowl beat the egg yolks and sugar on medium high speed with an electric whisk until thick and pale in color and falls in ribbons when you lift the whisk, about 5 minutes. Stir in the coconut milk, vanilla and rum. In another mixing bowl (you can also transfer the batter to another bowl and clean the mixing bowl), beat the egg whites on medium high speed to soft peaks. Gently fold the egg whites into the rest of the batter in 3 additions. Stir in half of the pineapple pieces. Pour the batter into the prepared sheet pan. Sprinkle the remaining pineapple on top of the batter. Bake until cake is golden brown and the center bounces back when touched gently, about 30 minutes. Combine the coconut milk, sweetened condensed milk and whole milk. Use a skewer or fork to poles holes in the cake, pressing them all the way down to the bottom. Pour the leches mixture over the cake, careful to cover it all. Cover with plastic wrap and chill in the fridge for 3 hours or overnight (see Notes). 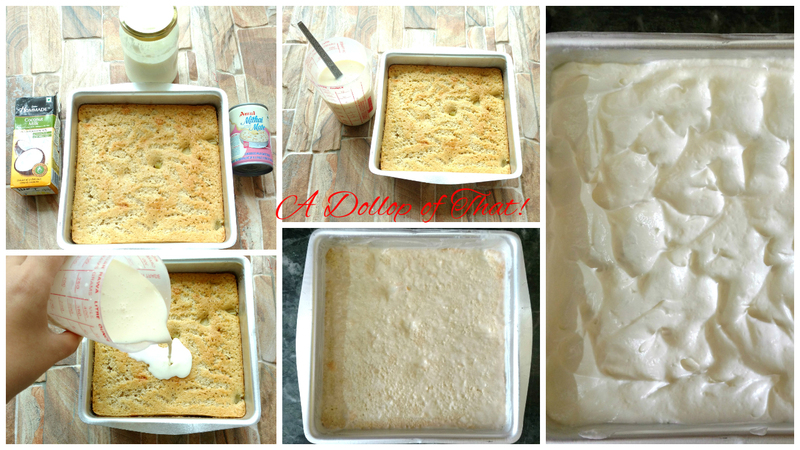 Whip the powdered cream with cold milk until it starts to thicken and holds soft peaks. Spread the whipped cream on top of the cake. 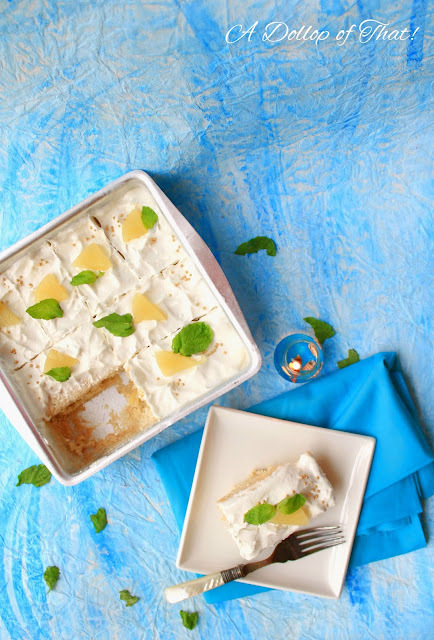 Top with the toasted coconut and slices of pineapple with a mint leaf for a beautiful colour contrast. 1. 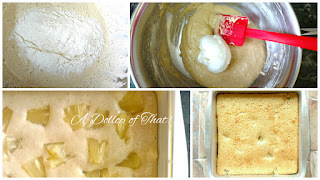 If desired, you can use canned crushed pineapple. 2. 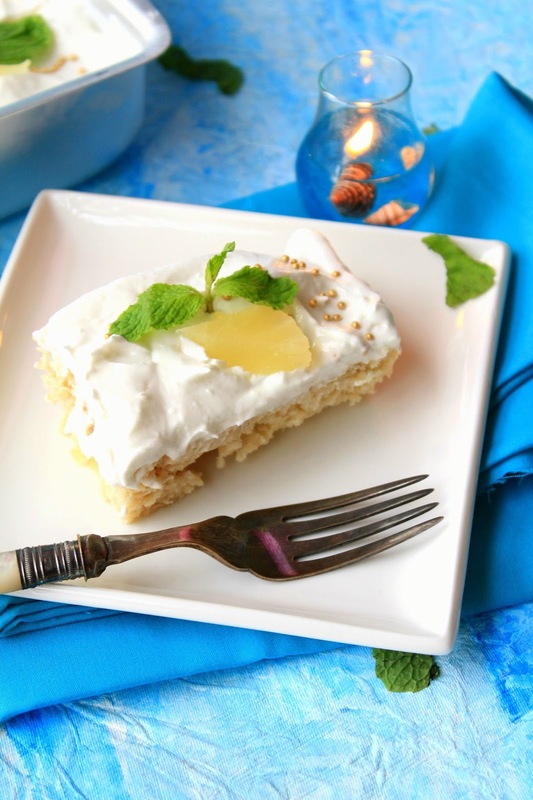 You can use sweetened or unsweetened flaked coconut, per your preference. 3. If you do not have time to let the cake sit for 3 hours, you can pour only some of the leches mixture on top of the cake so there is less to be soaked up. The cake won't be as moist, but it will work. Labels: Cakes, Desserts, Fruit, Kid friendly, Party Perfect!